Monday was a rest day after my long run on Sunday- I didn’t sleep well at all on the Sunday night and so felt pretty shattered- we had an early dinner and then went out on a walk to get some fresh air before it got too late. We also finally put up these pictures in our bedroom- we’d bought them over Christmas and just kept forgetting until too late in the evening (can’t be disturbing the neighbours with late night hammering). On Tuesday I went out on a run after work- I got home later than planned and still felt pretty tired so kept it shorter. It started raining while I was out- really cold sleety rain, so I was pretty pleased when I got back home. 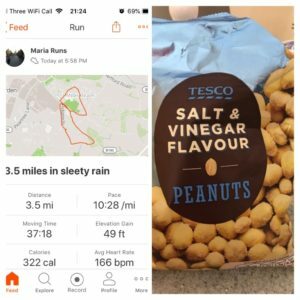 I had a handful of these salt and vinegar peanuts which sounds like a weird combination but as a fan of salt and vinegar anything they are pretty food for me (although these Tesco ones actually burn the inside of my lips a little bit- not so good). On Wednesday I had a little walk around to the amazon locker to collect a parcel, before heading off to yoga- our teacher had brought a little electric heater with her so it wasn’t too cold in the room. I found it tough- my arms lose strength very quickly it seems- although when we practised the headstand I opted for the tripod one (I just can’t get anywhere close with the other one) and managed to lift one leg up at a time, and we’ve not done that since before Christmas so I was pretty pleased. I could have fallen asleep in the final relaxation! 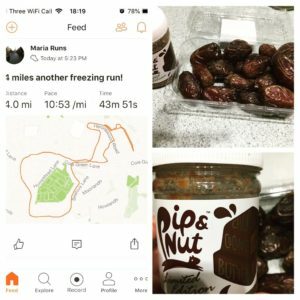 On Thursday I had another really cold run, this time managing 4 miles, and had another favourite post-run snack of dates with peanut butter- at the moment I have a jar of Pip&Nut hazelnut chocolate spread, which is really good and the closest to nutella I can get without feeling guilt for the orangutans. 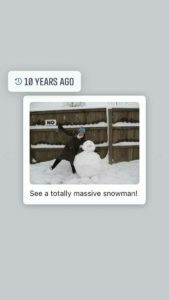 Funnily enough this came up on my facebook as a memory from 10 years ago- it seems snow at the end of January isn’t that uncommon. 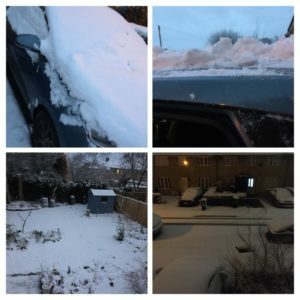 Friday morning I was greeted with a fair bit of snow, and although loads of schools locally were closed (including the secondary school right by the one I work at) my school was open, so I had to spend ages clearing the snow off my car, which isn’t easy when you are as short as me. To get it off the roof I had to open the rear doors and stand on the back seats. Then when I was driving at one point I thought someone was throwing snowballs at my windscreen but it was just a van with a load of snow on the roof, and the snow was coming off in big clumps and hitting my windscreen. I was not amused. 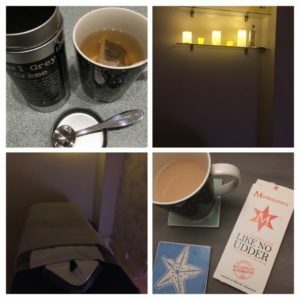 After work I headed into town as I had a massage booked (very much needed after all that snow-clearing!) and then once home I warmed up with some Brighton treats- Bird&Blend Early grey and some Montezuma’s orange chocolate (dairy free milk-style chocolate). 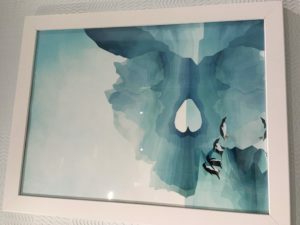 We also put up this picture in our bathroom (I do love penguins and not sure why the image has rotated sideways). It’s good to refresh what is up on the walls a bit. We’ve been watching a bit of Shipwrecked this week and who knows if I am watching with rose-tinted spectacles but it isn’t as good as I remember (it was a Sunday morning staple when I was younger). Although Andy found this rather horrifying article here from one of the original contestants. After watching the Fyre festival documentary on Netflix we’ve seen rather a lot of the perfect beach holiday images (and know that what’s going on behind the scenes isn’t what you see). On Saturday morning there was still a fair bit of snow about, and lots of it had been compacted and then frozen overnight to make lovely smooth icy pavements, so when local parkruns started cancelling I knew I’d head to Panshanger as it is pretty much all off road and they don’t usually cancel for snow. I got there a little early (mainly because I thought parking would be busier than usual because of people coming from their cancelled ones) so to keep warm I had a little run through one of the fields (not such a good idea because I got snow in my shoes which then melted and gave me cold wet feet). Anyway, I had also seen on facebook that Wonky Bear (a bear made from old parkrun branded high-viz vests) was going to be at Panshanger, so I was keeping an eye out in the car park for him. I ended up chatting to one of the runners from my club, and then I wandered over as the new runner briefing was being held. I saw one person with the cow cowl on, so I asked her where she was from (Walmer and Deal parkrun) and we had a little chat about our local ones and what Panshanger was like (she’d also been to Ellenbrook before)- I was about to ask her if she owned a bear (she wasn’t holding a bear, but that is the parkrun where Wonky Bear is from- I was thinking how I would explain my strange question if she said no) when some people she knew came over and chatted to her, so the moment was a bit passed (and would have been even harder to explain in front of more people!). As we started I ran past the RD’s open car boot and saw Wonky Bear sitting in the boot so I thought I’d find him at the end instead. The run was gorgeous- the park was covered in snow in places, and totally clear in others. I kept on taking my phone out to take photos, most of which turned out pretty well seeing as I was still running and watching my footing. Most of it was OK underfoot but the final part which runs alongside a field was tricky as the snow had been compacted and it was very smooth and slippery- I ended up running in the field again in an effort not to slip over. After finishing I was looking around for the bear and met another runner from my club who I’ve not seen for ages, so we walked back to the car together. 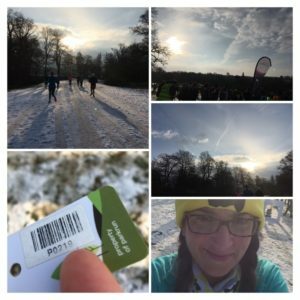 (The run report which came out today was written by Wonky Bear, and there’s a lovely picture of him sitting in the snow at the finish line by the parkrun flag- not quite sure how I missed him!). 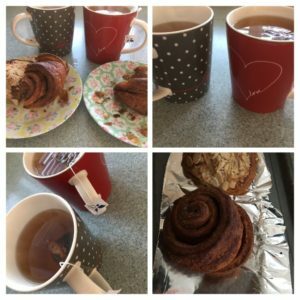 Another bonus of going into town on Friday night was a little trip to Gail’s bakery for breakfast- I bought a chocolate almond croissant and a cinnamon bun and heated them up in the oven while I made tea, and then we had half of each for breakfast. They are both so good, but the almond filling contains loads of whole almonds- it is just divine. Saturday was then mainly filled with getting a lot of work done, with a short break to walk into town and get my free Starbucks. 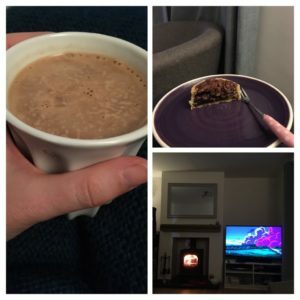 Then on Saturday evening, the final good reason for town was a Pudding Stop visit- we shared a pecan pie, made a hot chocolate, had the fire on and watched Laputa Castle in the Sky- so cosy. On Sunday morning I had pencilled in 12 miles, but with all the snow and ice around I couldn’t decide on a route. I considered doing two laps of a 6 mile route, but a couple of the routes have parts that I didn’t think would have clear pavement, with no verges to run on, so in the end I decided to do 4 laps of a 3 mile route. I did wonder if it would be dreadfully dull, but with some podcasts for company it was actually OK. The lovely weather helped of course- everywhere was looking so beautiful with all the snow. There were a couple of places with ice on the pavement where I really had to slow down, but for the most part it was OK and I managed to keep a faster pace than my recent long runs. I don’t usually like running close to home mid-run as the temptation is to finish, but because the lap was only short it wasn’t too bad. I think partly why I managed to run a bit quicker was because I felt closer to home, so I felt like I was on a shorter run if that makes sense? It’s funny how the mind works. When I got back (12 miles complete) Andy’s parents had come over- they were going to have a shower as their bathroom is being done. I had some porridge and tea while we caught up with them (they’ve been in India on holiday). Later we had a walk but after a couple of miles I felt very very tired- it was catching up with me a bit then I think. I was fiddling about on my phone later in (while catching up with Winter Watch) and I noticed that my goal streak is now at 200 days! 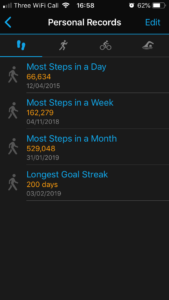 I’m really pleased with this- I have always had a daily average of over 10,000 steps, but I used to miss it on one or two days a week (particularly the day I went to yoga)- I’ve been trying hard to keep it going by having a walk when I get home from work, before I go to yoga and I have kept it up even during the horrible wet and cold days. Do you have a steps target or something else that you aim to keep consistent? Did you have much snow? 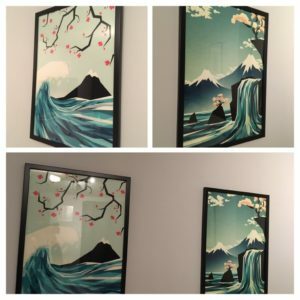 Do you have photos or art or anything on your walls at home? How far do you think you could run in laps? I did a 6 mile event on a 400m track once, so I think I am OK with laps, although with a parkrun I will always choose a one lapper over multi-laps any day. 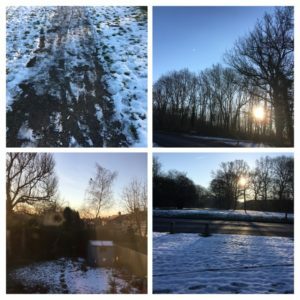 Author Maria RunsPosted on February 3, 2019 Categories General ramblings, Running, Stuff I love! No significant snow for us, just a bit of ice. And now today so much rain, urgh! I saw Wonky Bear when I was at QECP parkrun last year. Such a lovely idea. When I did the Goodwood Marathon and it was 11 laps that was tough. It’s not something I’d jump to go and do again. I found it very dull. I think it didn’t help that the course was very samey all the way round. I think if I was out in nature a bit more it would have been better. Yes the rain today has been horrible- so murky and lots of fog with it too. 11 laps sounds tough, especially on a road course like that- I think I did 4 laps when I did the cakeathon and felt like I could have carried on because the loops had nice scenery so that helped. Well done on your step streak. I did this a couple of years ago and got it pretty high before I was unwell and broke it. Never quite got back to it again! We had a little snow, but really the biggest issue was ice. 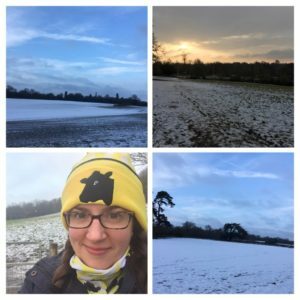 Winter can be so tough for runners – I’m fine with the cold but don’t like it being slippy underfoot. Yes the ice is way worse than snow. I got to the point with the step streak when I knew I would have to be incapacitated in some way in order for it to end! I feel like that! Or on a very long haul flight!